Special thanks to our friends, Tina & Damian for watching Walker Dennis for nearly four hours before we made it back to pick him up. Without them, we’ll never watch movies in the theater. This film is an absolute blast! We are going for full spoilers here. In 1991, we see Winter Soldier being sent on a mission to kill two targets. In Largos. The film puts the year and the countries’ names in giant white text, which feels like a bold choice. I really like how we first see Captain America leading his team of Avengers – Falcon, Black Widow and Wanda. They are chasing Crossbones and we see some great team dynamics. Everyone gets a moment to shine. Unfortunately, one of Wanda’s moments is that Crossbones tries to kill himself (and Cap) and she starts floating him to the sky. He doesn’t quite make it there and explodes, taking out an entire floor.. Seven Wakandans were in the building, and are now dead. At MIT, Tony gives a speech and a demonstration of a new therapy tool. It lets you essentially have a holodeck session from Star Trek Next Generation. He relives a moment with his father (returning John Slattery) and his mother, played by the beautiful and elegant Hope Davis! I’ve liked Hope Davis ever since I saw Mumford – one of my all time favorite films! We see a young CGI Robert Downy Jr. that looks like it could have been from one of his earliest films. Though the scene lasts too long and I start thinking about how it is only slightly better than the face lifts that Patrick Stewart and Ian McKellan received in X3. We get the first hints that Tony and Pepper are no longer a couple. Jim Rash, of Community fame – who the Russo Brothers directed this film (and Winter Solider AND the next two Avengers films) also directed Rash in several episodes of Community. General Ross, now the Secretary of Defense, has come to the Avengers Compound with news. I like how William Hurt came back to reprise his role. He is there to tell them about the Sokovia Accords. Cap is not a fan of the Accords. The UN is run by dudes, and dudes have agendas. What if they don’t approve of a mission that the Avengers really want to go on or are told to go on a mission that they don’t want to be involved with. I’m not sure how anyone can be Team Tony but I’m definitely Team Cap, I was back in the original comic storyline and I’m still committed. Vision makes a few good points but he’s wrong as he is on Team Tony. Vision makes an argument about escalation, buy does his best not to use that word as that is how Batman Begins ended with that incredible speech of Commissioner Gordon’s. I do like Vision and Wanda together, I wish it had more romantic undertones, instead of me reading too much into their moments. Him wearing that sweater is pretty great too. If they don’t sign the Accords, those members will no longer be Avengers. The character who will later be revealed to be Baron Zemo – played amazingly by Daniel Bruhl, torments a retired Russian general. I sort of recognize him from Inglourious Basterds, at least, I can visualize him from it. I need to watch Rush to see him with Chris Hemsworth. I’ve never seen this before but he hangs the general upside down, so that his head is in the sink. The sink continues to fill so that, ideally, the water will rise to the point that it goes above his nose. Seems like a truly gruesome way to torture someone and to die. He really wants to know where Winter Soldier was kept in 1991. Oh, we saw earlier that Winter Solider can be controlled by repeating 12 words in a certain sequence. Such a great speech and Emily really nails it. We can see that Cap likes her too, she’s Peggy’s niece. but bravo someone tricky her to get into this outfit and getting photographed. Vancamp and Chris Evans have great chemistry together. There is a moment where the two kiss and Falcon & Winter Solider totally see it and give Cap thumbs up, like jerk best friends. We don’t get enough of this but whenever Falcon and Winter Solider are together, their rivalry is so fun to watch. They are both best friends of Steve’s and they know it and hate it. 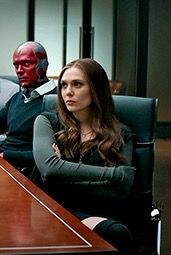 Vision is alone with Wanda, she doesn’t know it yet but she’s not allowed to leave. She likes Vision and we can tell he likes her, but there isn’t enough romantic tension for my taste. Wanda is playing the role of Nitro in this but is then quickly forgotten about, for a sizeable chuck of the film. I guess that happened to Nitro too, in the first quarter, he was mentioned a bunch but then the story moves away from him and he’s forgotten. Outside of the Wolverine tie-in issues, of course. VIENNA. The Accords are being signed by like 119 countries. We meet T’Chaka, the current King of Wakanda. So we know something horrible is going to happen to him. He seems very friendly. T’Challa is standing by a window and sees an oddly parked white van. The van explodes and T’Chaka dies. The world suspects that Winter Soldier was the cause of the explosion. Cap and Falcon go off to bring him in, ahead of the military and police. Black Widow tells them not to as they are not signed Avengers. T’Challa is played by Chadwick Boseman who was Jackie Robinson in 42. A film I still need to watch. I know him from a nonhit NBC show, Persons Unknown, that we watched on Hulu or Netflix, years later and I still think about to this day, like three years later. He was also on Lincoln Heights, a show my wife started watching, as she watched nearly everything on ABC Family but not so much now that it is Free Foam. At first, T’Challa is bad arse but it isn’t until the final scenes of the film when I became all about Black Panther. I do like the character, especially written by Christopher Priest and his “Sturm und Drang,” Black Panther Volume Three Issues 26 – 29. Such a great storyline that involves all of the Kings of Marvel – Black Panther, Magneto, Namor and Doctor Doom. So great! We are introduced to Everett Ross, played by Martin Freeman, Bilbo Baggins from the Hobbit films. I wish we got a scene with Everett Ross and T’Challa, that would have been fun for this Christopher Priest fan. I really need to watch BBC’s Sherlock, especially now that Freeman (Watson) and Benedict Cumberpatch (Sherlock) are now in the Marvel Cinematic Universe. Also, Doctor Who’s Steven Moffat is heavily involved in the series. Plus, the seasons are way short so I should be able to do so. I’m working my way through X-Men Evolution Season Two (expect to see that post one of these days) and the OC (a show I’ve been wanting to watch for a long time and Hulu now has) then maybe I can watch Sherlock then. If my wife doesn’t want to watch it as well. We like Elementary so she might want to see Sherlock, same characters but that’s all they have in common. The chase sequence with Winter Solider being chased by Captain America, who is being chased by Black Panther who is being followed by Falcon, is so great! Black Panther, in action, is a real treat to see. That stairway sequence that starts it, and how Cap doesn’t want to fight the German police but he has to protect his friend Bucky, is so much fun. BERLIN. Cap and Tony are arguing about what to do. Zemo reads the twelve words and now the Winter Soldier is his. I like how Cap and Tony are about to reach an agreement but Tony says one wrong thing and Cap backs out of the deal. Tony’s dad mentioned a bunch over the years, how he knew Captain America, in his younger days. The government has taken Cap and Falcon’s equipment. Steve chases Winter Solider and has this great moment, on the roof, when he grabs a rail and the helicopter that Winter Solider is using to escape and Steve actually prevents the helicopter from taking off. He’s so strong! Bucky, finally under his own control, reveals that Zemo wants the other five would-be Winter Soldiers. We begin the sequence of heroes recruiting heroes to fight their friends. Sharon Carter gives back Cap and Falcon’s weapons. Cap recruits Hawkeye, who recruits Wanda. She takes out Vision, at the Avengers Compound. Hawkeye also recruits Scott Lang, Ant-Man and Paul Rudd’s first minutes are instantly classic. The film really takes a depature here as we lead up to one of the best scenes in a film, possibly ever. We’ll get to that in a few paragraphs. Ant-Man shakes Captain America’s hand, way to long. Lots of jokes here and I want another Ant-Man film, so quickly. Meanwhile, Natasha and Tony chat. She wants to recruit Black Panther and Tony wants to recruit someone else. QUEENS. In a very small apartment, we see Marisa Tomei as Aunt May. I honestly thought we weren’t going to see the character outside of the airport scene so this entire scene (and how long it lasted) was a very pleasant surprise. We of course, meet Tom Holland, the third actor to play Peter Parker, in fifteen years. He sort of looks like a young Tobey Maguire – they both have wide faces. Maybe I’m crazy. Turns out, RDJ and Tomei dated back in their early acting days. Both were together for films “Only You” and “Chaplin” which I’ve seen the second one but don’t quite remember Tomei being in it. I’ve liked Marisa Tomei but when I look at her films, I haven’t seen that many of them so I’m not sure where I really like her from. I didn’t care for My Cousin Vinny, not when it came out (I was too young) and I couldn’t get into it a few years ago either. Too much that Joe Pesci, I like mine a little more controlled like in JFK or in smaller doses like in the Lethal Weapon films. What Women Want, The Guru and Anger Management, I’ve seen her in, not large parts but she’s the aspect in those films. I don’t quite remember her from both Wild Hogs or Loverboy but I’ve seen those. She was interesting in Lincoln Lawyer, a film I couldn’t get into. Before the Devil Knows You’re Dead is a good film, while she’s on screen. She was great in Crazy, Stupid, Love. I still want to watch the Wrestler. She had a small part in the great, The Big Short, film too. Tom Holland is a new face to me, he’s great as Peter Parker and sign me up for that upcoming Marvel / Sony Spider-Man film. He tries his best to not repeat “With Great Power Comes Great Responsibility” when Tony asks him why he fights the good fight. Have to save that for his solo film, I suppose. I like how small their apartment is and how Peter had to build everything he wanted. Tony has great chemistry with Peter too, I’m glad RDJ is signed on for Spider-Man : Homecoming. I imagine at some point, that film will have a dancing scene in it. The Airport Scene. So many great scenes leading up to this and out of this but this scene, I just want to watch again, if that’s possible without spending twenty dollars. Thanks to Tumblr user, ageofsuperheroes, for the following images. Plenty of images of Team Cap but it was so hard to find an image of Team Tony, I imagine due to Spider-Man. I really like how they kept the white eyes, that’s crucial ever since Amazing Spider-Man did it right. I like the bold reds and the blues and how separate they look. I know there are smaller details that might bug me but overall, it is a costume I can approve of. I’m hoping that we don’t get too much of the make-shift outfit in his own film – I”m also hoping we don’t get an hour of origin story either – and so his solo film takes place 30 minutes before Civil War and the rest of his film takes place after the film. We get some great matchups here. Spider-Man gets plenty of time to banter. Falcon has to tell him to stop at some point. Ant-Man gets flung from one of Hawkeye’s arrows into Iron Man’s suit. Black Widow fights Hawkeye. Black Panther gets to fight Winter Soldier. Falcon v War Machine. Ant-Man turns into Giant-Man, as there is an ant in every giant. That’s a WordWorld reference for you folks that don’t young children. Thanks to YouTuber Abdoukarim Bonitzer for hosting that video! Vision phases through Giant-Man, and Scott Lang freaks the heck out. I wish Kitty got to fight this much, like Vision does, in the X-Men films. 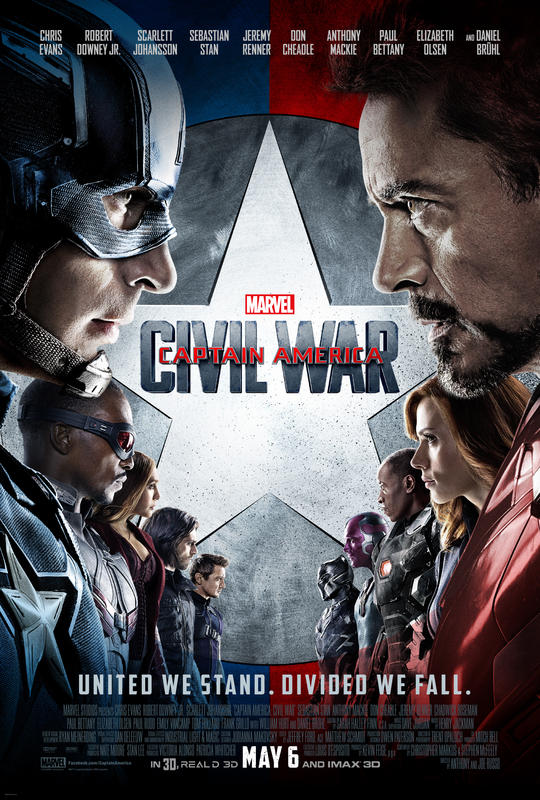 Captain America and Winter Solider steal the Avengers Quinjet, after Black Widow lets them do it. In the chase, Vision misses Falcon and hits War Machine, knocking him out of the sky. Poor Rhodey is nearly crippled by this action. Tony is sad that his friend is hurt. 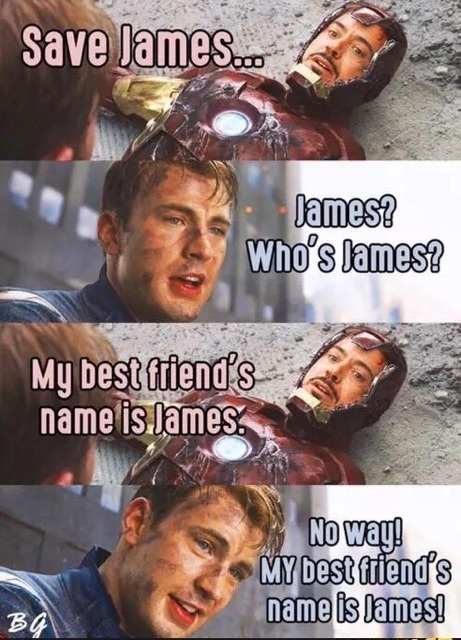 I kept waiting for this meme to take place in the film, but that would have been too much fun in a film that is already pretty fun. Black Widow knows she’s going to be in trouble and leaves. Spider-Man’s mask is lifted, providing a reason to have Holland on set, as he clearly could have been CGI-ed up to that last part, but clearly he was present as he has such a presence. Bucky tells Cap, in the Quinjet, that he remembers all of his kills. 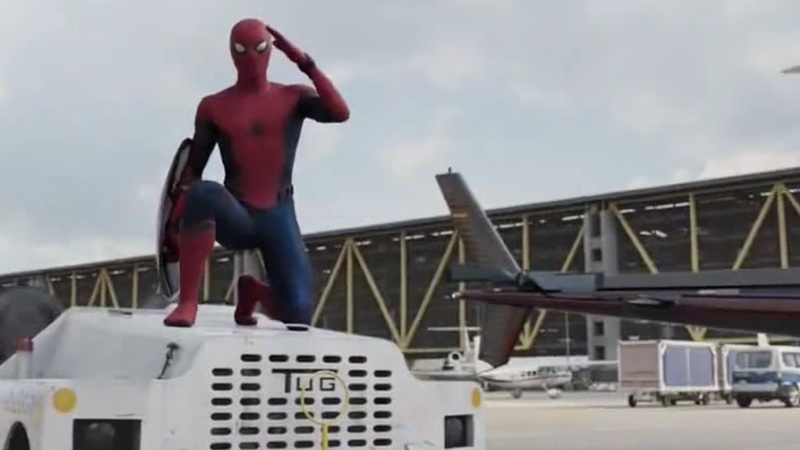 Tony, in his own jet – and this reminds me that I do sort of like Iron Man’s new armor. Mostly red with yellow highlights. He learns that Bucky was set up and that it was Zemo, dressed as Bucky, that blew up the United Nations. Tony goes to The Raft, where Hawkeye, Ant-Man, Wanda and Falcon are being kept prisoner. Falcon reveals where Cap and Bucky went but only if Tony promises to go there as a friend and ally. Tony is all committed to this. Which I have to remember that we have yet to get the Cap/Bucky shield fight with Iron Man, which I can’t imagine how they get to that point. When they do, it is spectacular! All the heroes, including Black Panther following Iron Man in a jet, make it to the snow base that Zemo has been trying to get all movie long. He killed the five would-be Winter Soldiers, he never wanted them. Behind a glass plated door, he starts a devastating film. We see the beginning of the tape from the beginning of the film, but now we see who Winter Soldier killed. Winter Soldier straight up killed Tony’s parents! Including Hope Davis! If Cap was a good friend, he would let Tony beat on Bucky for like ten minutes and then break up the fight. Tony realizes that Bucky was under mind controlled but Winter Solider killed his mother so a beating must be thrown down. Zemo, not a German (which is a real shame) is from Sokovia and has been listening to voicemails throughout the film of his wife about their son. They died, and by the time he got back to his family (he was on a mission) the Avengers were gone and his father were holding Zemo’s wife and son’s dead bodies. He thought they were safe living so far out of the city but since the entire country was air lifted, no one was safe. Zemo wanted to take the Avengers out from within. Which may not have completely worked but the Avengers have definitely said and done things that no one will be forgetting anytime soon. 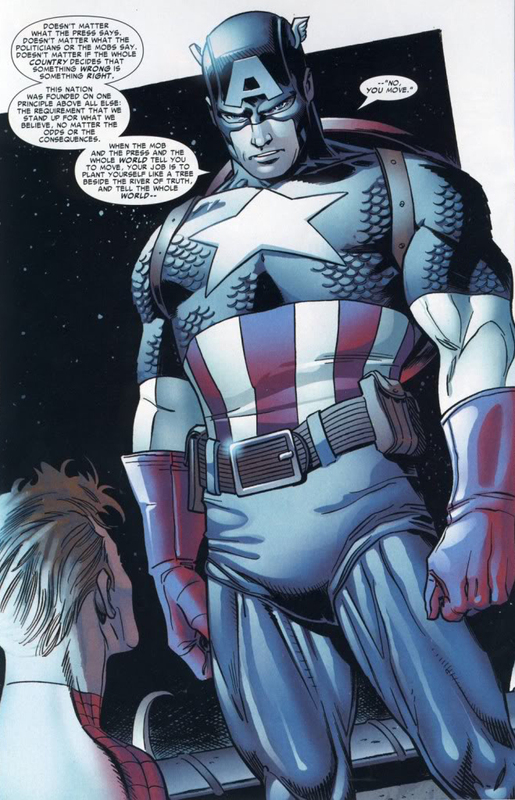 Since Cap won’t let a rightful beating happen, he prolongs the fight by getting involved. At the end, Tony wants his dad’s invented shield back and Cap drops it. Iron Man took off Winter Soldier’s cybernetic arm. Zemo is about to kill himself but Black Panther stops him and it is this moment that I really dig the character. His fight was never with Bucky so he changes to the proper target. Something Tony tried to do but his mother’s murderer is standing in front of him so justice must be beaten out. Everett Ross has Zemo (who I also wish had some sort of purple fabric on) in the same prison cell that Winter Solider was in earlier. Zemo’s plans may have been stopped but he hints that he may have additional plans that are still playing out. At the Avengers Compound, Tony got Rhodes some cybernetic leg braces. Stan Lee, as a FedEx carrier, asks Tony if he is “Tony Stank” which I and Rhodes enjoys. In the box, is an old school phone from Steve and a letter. Whenever Tony needs these (Secret) Avengers (that’s what I’m calling Cap’s team, in my mind) they will be there. As Cap is breaking out the Avengers from The Raft. Credits start to roll and we get the mid-credit sequence wherein Black Panther agrees to put Bucky on ice until they can find that red Russian notebook with the twelve words. Cap’s cool with it but it seems an odd choice. So then two minutes of credits and I have to use the bathroom so we missed the after credits scene. Thanks to YouTuber Closery for hosting this video so that I could pee with peace of mind This would have been fun to have seen in proper quality and sound. I forgot how Spider-Man and Cap shared that fun exchange about Queens / Brooklyn, that was a nice touch. Spider-Man also got to make a Empire Strikes Back reference too. This was such a great film, lots of humor and great characterization. Everyone got a moment to shine and clearly the Russos know how to handle this many characters so we don’t have to fear for the space Avengers films. I believe that captures all of my thoughts on the film. I’m not sure if I’ll get to watch X-Men Apocalypse, but who knows at this point. for refreshing my memory of the film.